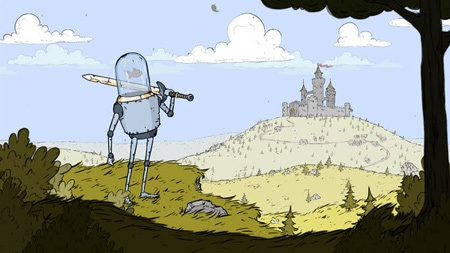 Feudal Alloy is a metroidvania-style action RPG by Attu Games, with fish-controlled medieval robots. Attu is an ordinary farmer robot who lives in a small cottage in sunflower fields. A bunch of outlaws attacked the village, stole their oil supplies and burnt his house. Fortunately, he managed to grab his old sword and fled into the woods. Try to defeat the evil and find your way back home. The game features dynamic action-combat system with swords, grenades, dodges and other special attack moves. You will have a huge, interconnected world to explore, filled with wide range of enemies, bosses and side quests. If you get stuck in the game, check out the video walkthrough and gameplay for the game. This entry was posted in PC Games, Walkthrough and tagged Feudal Alloy Cheats, Feudal Alloy Gameplay, Feudal Alloy Guide, Feudal Alloy Hints, Feudal Alloy Review, Feudal Alloy Solutions, Feudal Alloy Strategy, Feudal Alloy Tips, Feudal Alloy Walkthrough by Marvin. Bookmark the permalink.